More and more of us are moving to cloud-based email systems like Gmail. But as with all legacy apps, there's going to come that day when you're going to need to view email messages created by client-side email programs like Outlook or Lotus Notes. And yes, you will have already uninstalled those programs in order to free up drive space. Before you start grumbling and looking for those install disks, let me tell you about Message Viewer Lite. Message Viewer Lite lets you open Outlook .MSG files and Lotus Notes .EML files without having to have either of those programs installed! Plus, if you're looking through multiple files (as in, searching for important info manually), you'll be happy to know that Message Viewer Lite can be opened as multiple instances. Not only does Message Viewer Lite open your old legacy email messages, it also preserves the original message's formatting, so HTML and Rich Text elements will still show up! You can even install Message Viewer Lite as the default file handler, making reading legacy email attachments as easy as clicking on them. 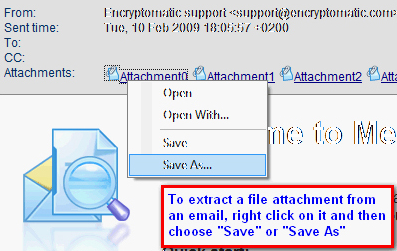 And if you're trying to extract attachments to those legacy emails, all you need to do is right-click or drag and drop! Message Viewer Lite is perfect for network admins eager to migrate their users to less problematic email systems! Open and view Outlook and Lotus Notes mail messages without needing to install those apps. Keep the original formatting of each email message. Assign the program as the default file handler and immediately open legacy email attachments with a click. Extract file attachments from legacy email messages. After you purchase MessageViewer Lite it may be used indefinitely. 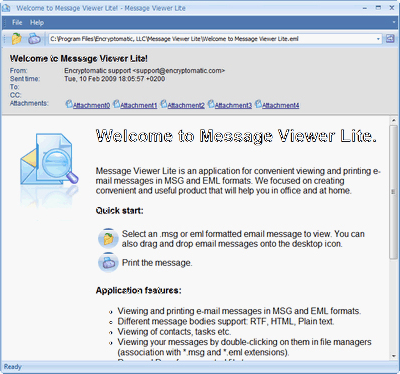 MessageViewer Lite is licensed per user, so if more people are going to use MessageViewer Lite you will need to purchase additional copies. An Affordable Exchange Server Alternative!